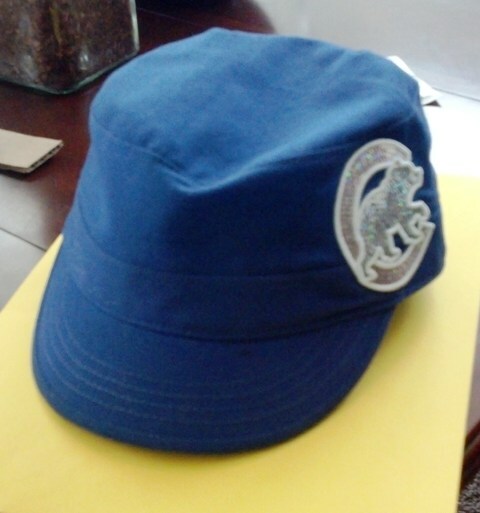 It is to my great fortune that both my begats ended up on the Chicago Cubs team for Little League baseball. (The older one in machine pitch and the younger in coach pitch.) 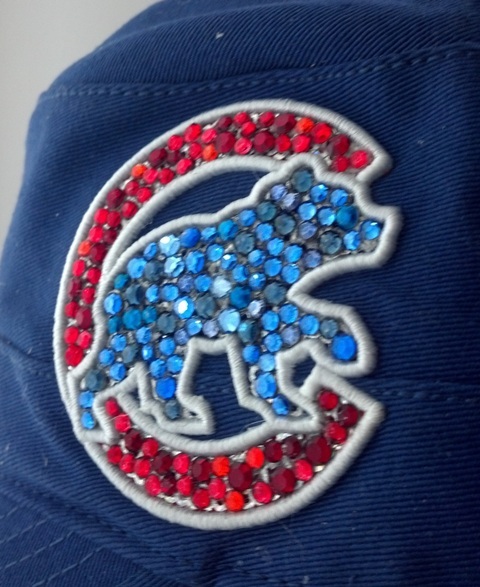 I could totally justify buying a Cubs cap and T-shirt to hubby! So, I made my purchases online. 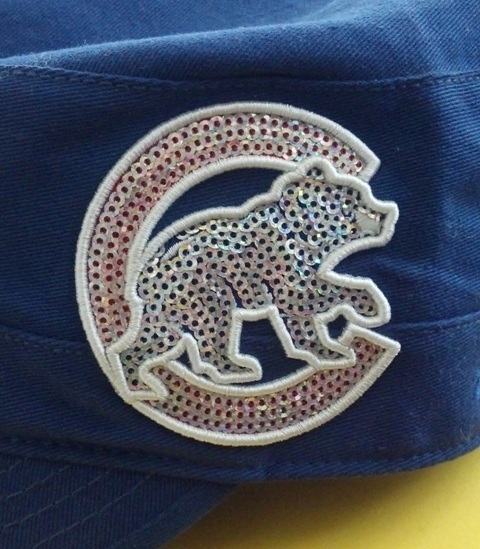 Here’s the “before” picture of the cap from the website. I prefer military style caps over traditional baseball caps because I like the shorter bill. Cute, huh? Here’s what I actually received. 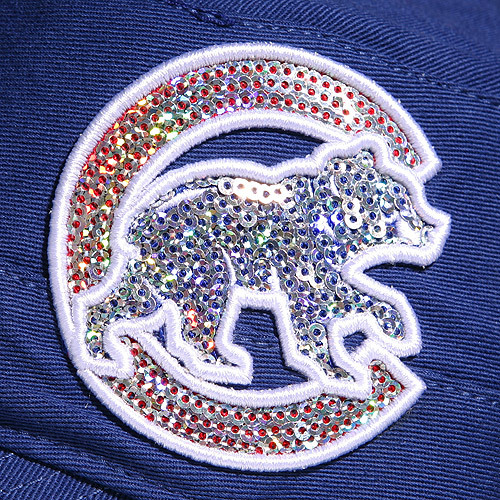 The sequins are quite lack luster and there were weird bald spots on the patch. The hat felt like it fit nicely however I didn’t notice the odd fit on my head until the hubby cheekily asked me, “Are you fighting for the Union? Where’s your musket?” Much to my dismay, I looked like a Civil War reenactment reject. 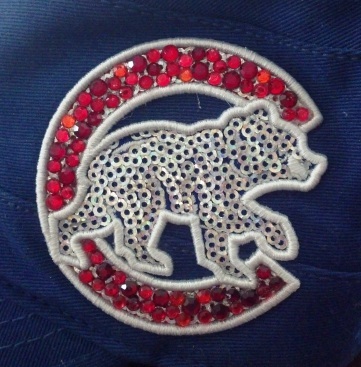 In an effort to detract from the stove top look, I decided to add the crystals as the hat’s focal point. An object in which you want to razzle dazzle! I chose my cap. Personally, I am not that confident in my free hand skills, so I like to choose things that already have a design on it. I embellish it from there. Patches or appliques with a flat area are good. Strong glue specifically designed for this kind of project. I like E6000 or Gem Tac. Craft glue (e.g. Elmer’s or Mod Podge won’t work for this endeavor). I haven’t tried super glue or Gorilla glue. I probably won’t ever try to experiment with those types of glues, knowing how well E6000 and Gem Tac work. Besides, I don’t want to risk ruining my project. Flat back crystals – Make sure they are the “No Hot Fix” kind. There are all sorts of different kinds of flat back crystals out there in the market. I like Swarovski because of the brilliance and shine the crystals emit. As such, there is an associated price tag to it. 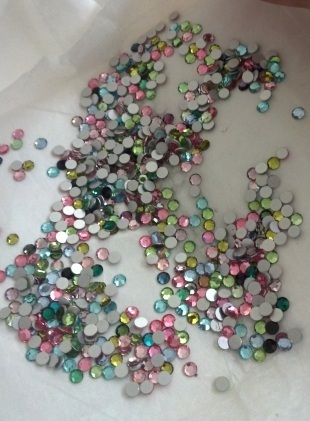 I bought a 10 gross (1440) of assorted vintage swarovski flatback crystals for $30 online at Harmans a couple of years ago. I still have a ton of them! Sorting colors can a be a minor annoyance, but worth all the sparkle in the end! Gem setter – this is a stick with a wax/gel ball on the end. This tool picks up the crystal and is used to position the crystal. First decide how you’d like your end result to look like. Validate that you have enough crystals for the project. Go so far as to lay them out without the glue first and decide if you like it. 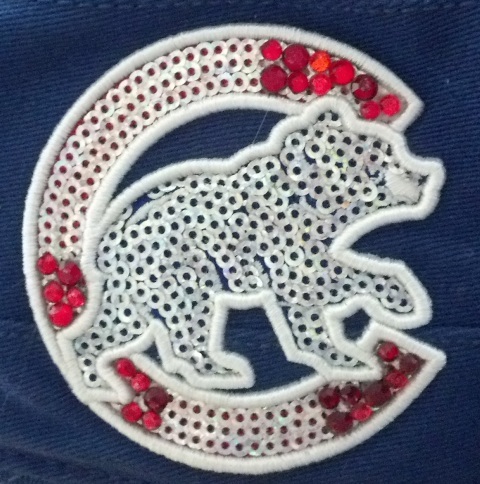 I chose SS12 and SS16 crystals in varying shades of red for the “C” and varying shades of blue for the bear. I say I did this because it gives it a lovely stained glass quality to it. Between you and me though, I did this because I didn’t have enough of any one color to complete the project. Squirt a small dab of glue on a scratch piece of paper. Using the toothpick, spread the glue evenly on to a small area you want crystals. Working quickly, use the gem setter to pick up the crystals and position on to your surface. I like to work starting from the edges and work my way toward the middle. Reposition the crystals as needed as you go before the glue sets in. Once you’ve strassed your entire area and it is to your liking, let the project dry and cure for 24 hours before you handle it. This will give the crystals a chance to adhere to the surface before it experiences any friction or wear. Blingification brought through fruition! Boo ya! This entry was posted in DIY, Uncategorized and tagged bling, DIY, strass, swarovski crystals. Bookmark the permalink. 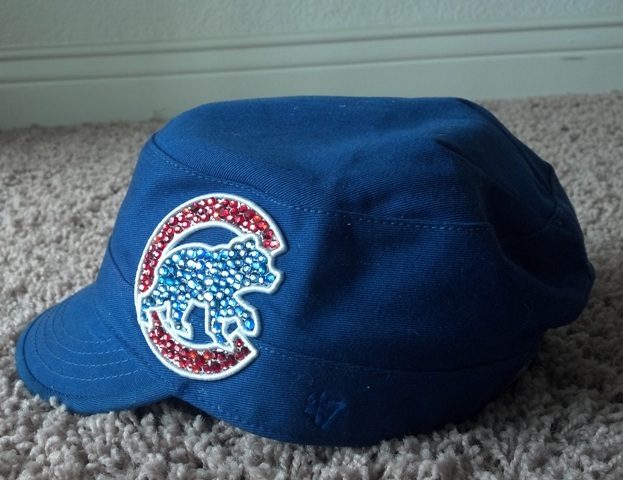 I love the hat you made and i am going to a cubs game sometime in July and was wondering if i could buy this hat from you! please let me know! 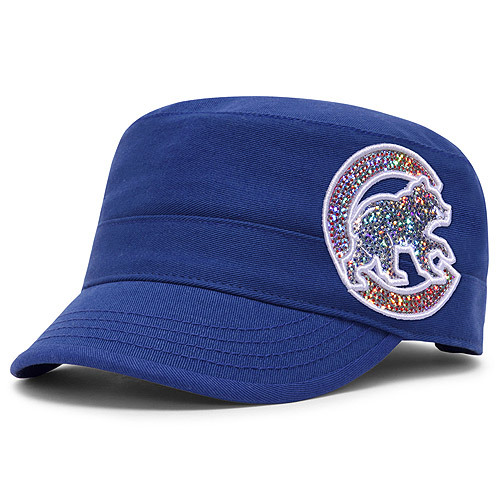 i cant find anything like it or even the sequin one online! So sorry to respond to this quite late! My notifications aren’t notifying me! Argh!